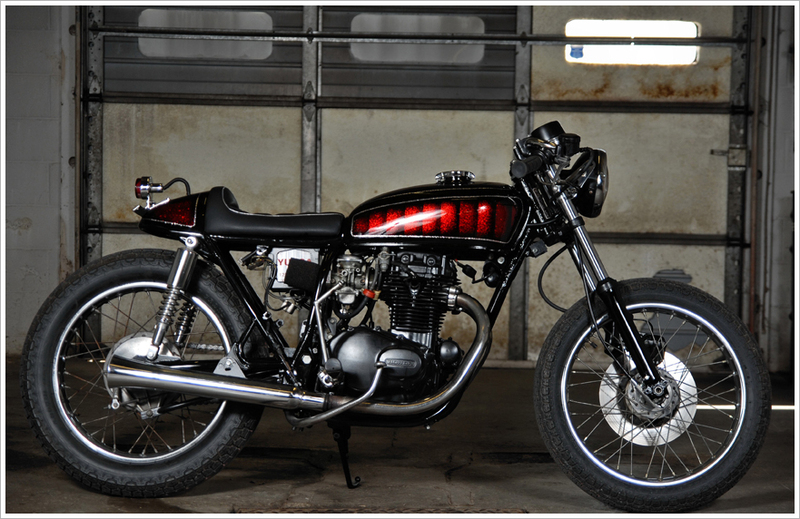 Yes I’ll admit it, I have a serious soft spot for Honda CB360 cafe racers. 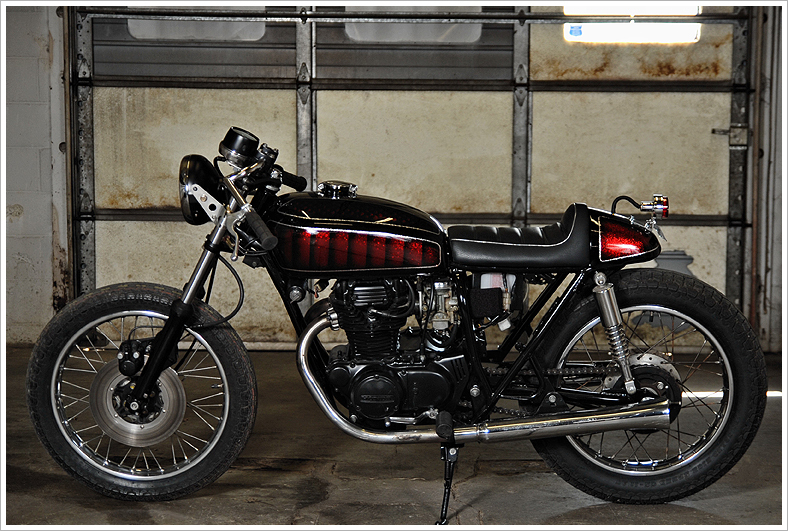 To this day, one of my favorite bikes posted on Pipeburn was Peter Cabral’s CB360. 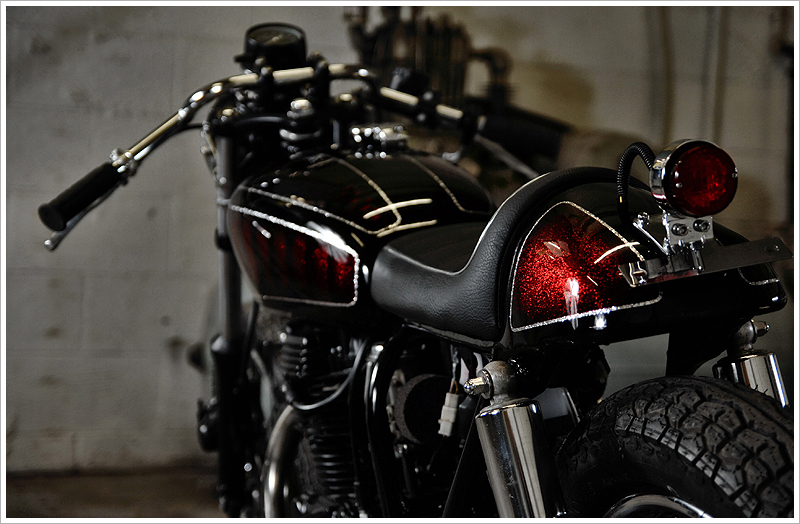 So when Jeremy Pederson from Relic Kustoms sent me pics of his metal flake painted CB360, I just had to post it. 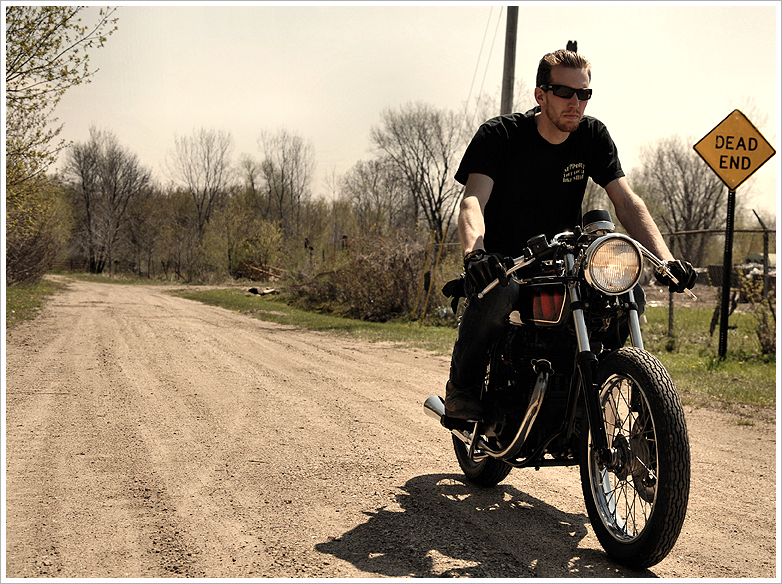 Jeremy Pedersen is a talented young pinstriper from Austin, Minnesota who paints hot rods, helmets and motorcycles. 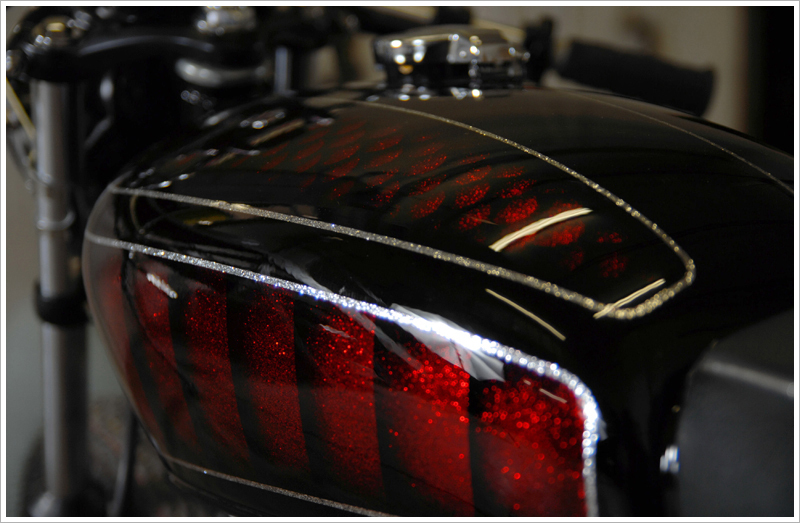 “I started Relic Kustoms back in 2005-2006 mainly doing pinstriping,” says Jeremy. “Since then, I have gotten into more airbrushing, metal flake and kandy work. I also do graphic design and screen printing. My brother Nick does the majority of the metal work and custom upholstery”. 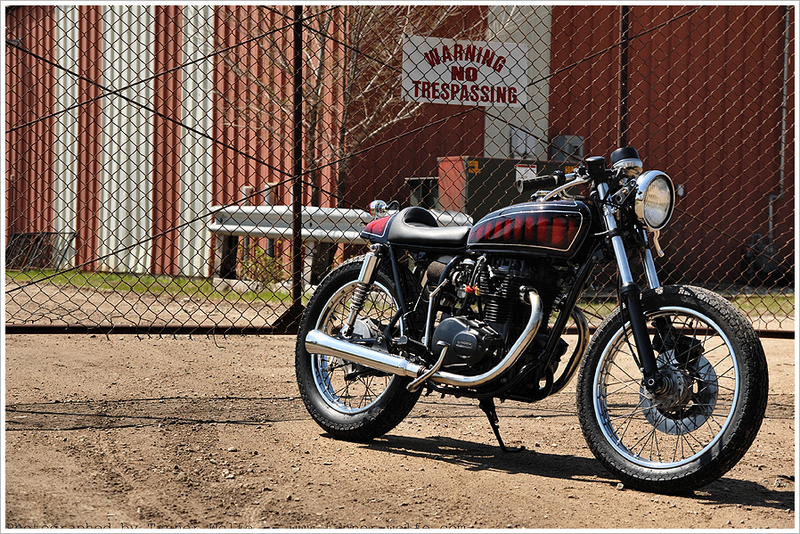 So together, the Pedersen brothers form the perfect team when it comes to restoring motorbikes and cars, and here’s the evidence to prove it. With two weeks before the St Paul World of Wheels show, Jeremy and Nick decide to try and turn this CB into a ‘show worthy’ bike. “It was torn completely apart. Engine, frame, and all sheet metal were blasted, primed and painted black. The tank and tail section were then flaked with silver Old Skool Flake, airbrushed with fish scales and louvers, and finally paneled and covered in House of Kolor Kandy Apple Red. Little brother made a new seat pan, shaped a pad and wrapped it in black double stitched panels with silver piping. Everything was then reassembled with just enough time for 2-3 hours of sleep, then loaded in the trailer, and head north to the St. Paul River Centre for the show. On the way home from the show, which is in February, the roads were so rough and covered with snow and ice, the bike bounced around and fell while in the trailer. The handle bars dug deep into the tank, ruining the fresh paint work. So, the tank was then repainted within the next few weeks before the bike was taken to the Donnie Smith Bike show, also at the St Paul River Centre. After that, I gave the bike to Nick, in appreciation for all that he helps me with. Once the Minnesota riding weather finally came around, he piled the miles on. This included a ride out to, and back from, the 2011 Sturgis Rally. Very impressive for a small Honda twin, as it was a 600 mile trip one way.” As with most of you guys, nothing really surprises us any more in regards to what these little Honda’s are capable of. And we’ve got a feeling this is just a taste of what the Pedersen brothers are capable of. Watch this space.